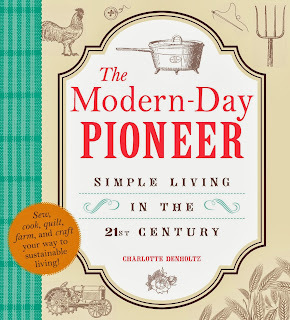 A Well-Seasoned Life: My First Canning Experience Courtesy of "The Modern-Day Pioneer"
My First Canning Experience Courtesy of "The Modern-Day Pioneer"
Anyone who has read my blog for a while knows my love for cookbooks. I have quite a collection of them. Lately, however, I've found myself drawn to a different genre of reading material - homesteading, modern pioneering, and self-sufficiency. I've been concentrating my efforts on building a library of reference books to assist and to inspire me into adopting a more deliberate and simplified lifestyle. 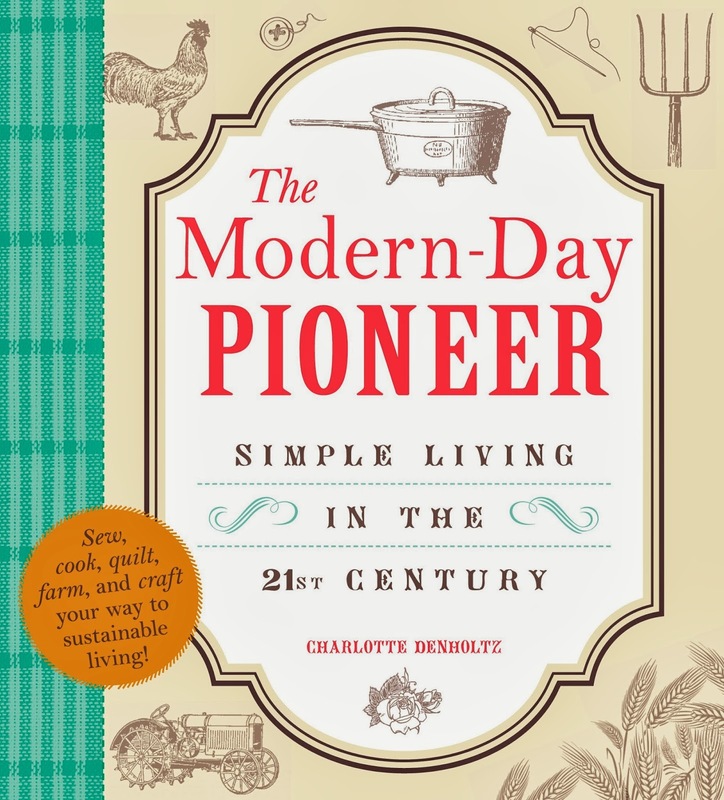 This book covers many areas of simple living. Not all chapters will appeal to every reader; however, the book is quite comprehensive and useful. If an area doesn't appeal to you right now at this point in your life, you may come back to the book in six months and decide that you want to learn about another aspect of modern pioneering. Some of the areas covered in the book are: making the most use from the land you have, canning and preserving, simple meals including breadmaking, homebrewing, prairie remedies for injury and illness, soapmaking, candlemaking, quilting and sewing. One of my goals this year is to learn to can. I've wanted to do this for a while now because it seems like the ultimate skill that you must acquire to consider yourself self-sufficient. Why have I resisted? It's just the unknown of it all. Terms like water bath, headspace, sterilized can be a little intimidating. Plus, with canning, I think jams and jellies. 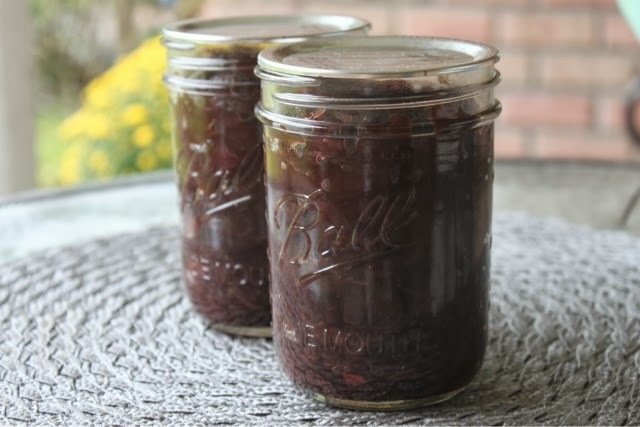 My family goes through about one jar of grape jelly every year so I knew it would be a waste of ingredients to make jelly. Who would eat it around here? 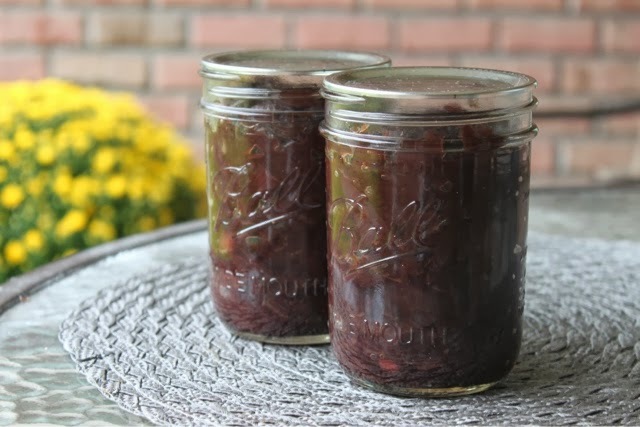 When I found this recipe in The Modern-Day Pioneer, I knew it would be perfect recipe to introduce me to that art form known as canning. I often make a similar recipe to this one that we serve over steaks. Delicious! In a heavy nonstick skillet, combine onions and brown sugar with olive oil; heat over medium-high heat. Cook uncovered for 25 minutes, or until onions turn golden and start to caramelize, stirring frequently. Stir in wine, vinegar, salt, and pepper; bring to a boil over high heat. Reduce heat to low and cook for 15 minutes, or until most of the liquid had evaporated, stirring frequently. So, how did my first canning experience go? First of all, I used a large canning pot that took forever to boil. By forever, I mean well over an hour if not two hours on my electric stove. Next time that I use this large pot, I will put it outside on the gas burner and I will bring the water to the pot instead of filling it with water and trying to take it to the stove. Way TOO heavy! My back is still feeling it today. ***Secondly, my instincts told me that this would NOT make six pints as it states in the recipe. I was right. I made two pints. Considering that this was my first time canning and I'm unfamiliar with the whole "headspace" measurement, I could have possibly put too much in my jars. If that was the case, I could have possible made two pints and one half pint at the most. Finally, I came away from this first canning experience with a sense of accomplishment. The final product does taste delicious. And, I've learned that I will stick to canning in half pint jars and that I will use my regular stock pot and can in small batches which is more useful to my family. As I begin my journey to become a modern pioneer, I know that The Modern-Day Pioneer will provide me much needed inspiration along the way. Disclaimer: The publisher provided me a review copy of the book; however, the opinion expressed here is my own. Wow! Good for you! I always are in awe of people who can. When I was younger I did a little of this. You should be very proud of yourself!! Just a tip to get the water in your canner to boil faster...Did you start with hot water? My MIL has been canning forever and when I mentioned that it took forever to get the water boiling in my canner, she told me she starts with hot water to begin with so it doesn't take as long. It was a simple solution, but as a "young" canner, I hadn't thought of it. No, I didn't. That is an excellent tip! Thanks!